While it may sound like something taken straight from the books of fiction, the Sandbox Tree (Hura Crepitans) is all too real for the scores of Central and South American farmers who’ve had their cattle injured by these explosive plants. Upon ripening, the fruit of the Sandbox tree will explode like a botanical hand-grenade carrying seeds up to 40m at 240kph, easily penetrating any animal or poorly placed window. 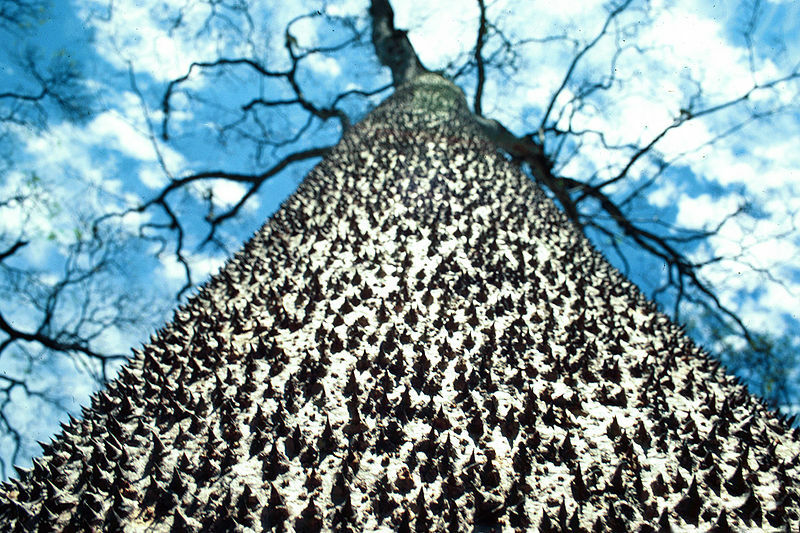 The Sandbox tree grows around 30 meters (100 feet) tall and 1 meter (3 feet) wide and is easily spotted by its bark which is adorned with deep brown spikes from base to crown. The natives of South and Central America have taken to decorating with the spikes using them as beads that can give anything from clothing to boxes a certain lethal beauty. The generally brownish-green fruit is distinct with its pumpkin shape and is about the size of an adult’s fist. As with about any fruit, the fruit of the Sandbox Tree is indeed edible, but it won’t go down without a fight. The ever so appetizing fruit of the Sandbox Tree contains seeds that will not hesitate to cause cramps, vomiting, and diarrhea, but they do make for a fabulous set of tribal earrings. As if the Sandbox Tree didn’t already have enough killing tools, natives also use the poisonous sap for incapacitating decent sized mammals or fish. The sap of Hura Crepitans causes gruesome red rashes when in contact with the skin and blindness when in contact with the eyes, making it quite a danger to handle. Ranking consistently in the top 10 of dangerous plants, the Sandbox Tree isn’t much of a house, yard, garden, or really any type of plant that’s meant to be anywhere around people, but it’s a pretty darn cool oddity of nature.